Groton, Conn., was recently awarded a $726-million contract for the construction of the lead ship of the SSN-21 Seawolf Class attack submarine. The work is expected to be completed May 1995. The contract was awarded by the Naval Sea Systems Com- mand, Washington, D.C. (N00024-89-C- 2000). January 1991. The contract was awarded by the Naval Sea Systems Command, Wash- ington, D.C. (N00024-85-C-6259). Samson Tug & Barge Company, Sitka, Alas- ka, was recently awarded an $8.6-million contract to transport containerized and breakbulk cargo between Seattle, Washing- ton, and the Naval Air Station, Adak, Alaska. Military Sealift Command, Washington, D.C. (N00033-88-C-8503). Space and Naval Warfare Systems Com- mand, Washington, D.C. (N00039-89-C- 0067). The submarine is 360 feet long, has a beam of 33 feet, submerged displacement of 6,900 tons, and a speed of more than 20 knots. Systems Command, will hear 18 technical paper presentations on topics from current government- industry shared quality upgrades for logistics to specific problems geared to enhance Navy fleet readi- ness. Symposium will include: Vice Adm.
Duke Street, Alexandria, Va. 22314; telephone: (703) 836-6727; and fax: (703) 836-7491. Noon—Exhibit Hall open. Advance registra- tion desk open. 5 p.m.—Social hour—Exhibit Hall. Wednesday, March 8 7:30 a.m.—Registration desk open. 8:15 a.m.—Welcome address by Captain J.
LOGCEN, and Dr. Alfred Skolnick, presi- dent, ASNE. 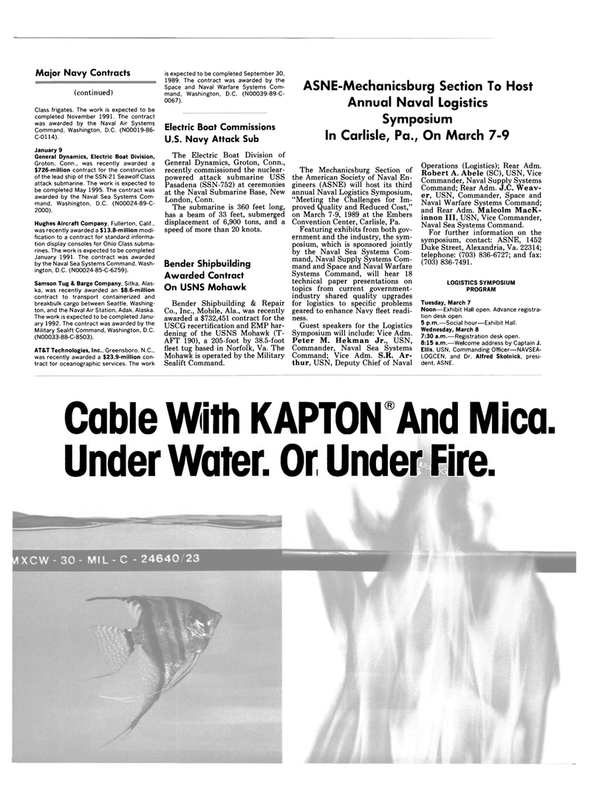 Cable With KAPT0N9 And Mica. Under Water. Or Under Fire.